With the holidays fast approaching, there are countless ways to incorporate your new puppy into the holiday festivities. Whether it be through pictures with Santa, toy stockings, special treats and so much more, your puppy can get in on all the action with you. 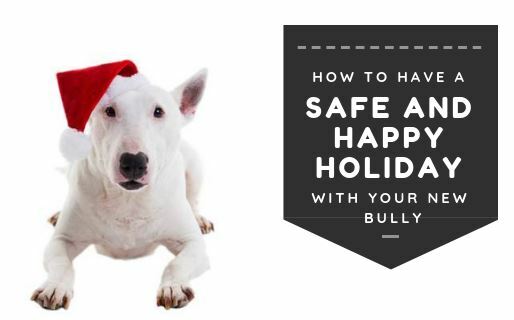 Regardless if you recently found an English bull terrier for sale or you got him last year for Christmas, there are a few things to keep in mind to ensure that you and your puppy have a safe and enjoyable holiday season. When setting out your holiday decorations, keep your puppy in mind. Your most treasured decorations may just look like a giant chew toy to your bully. Be sure to place these items out of sight and/or out of reach of your puppy so nothing gets broken and your puppy stays safe. Avoid using any tinsel or ribbons on your Christmas tree, as these can pose a dangerous risk to your puppy. If eaten, they can get lodged in their intestines, requiring extensive emergency surgery to remove. The holidays are an exciting time for your puppy. It will be the first time you are bringing a tree into the house, extra lights everywhere, food and people galore! That is why it is important you keep a close eye on your puppy throughout all the festivities. At this time of year crate training proves to be a valuable skill for your puppy, as you’ll be able to send them to their crate where they are safe and happy during times when you are unable to supervise them closely. Another trick is to keep your puppy leashed inside the house. This will prevent them from investigating the tree, presents, and decorations too closely. A common mistake that many new puppy owners make during the holidays is to drop their regular routine and focus all their free time on their puppy. Instead, it is going to be in everyone’s best interest, including your puppy’s, if you stick to a routine as much as possible. Even if you have time off from work, sticking to a routine will prepare them for after the holidays when you return to work and your regular routine. It is important to find time to take your puppy on walks amidst all the holiday parties. This will help keep your puppy happy, healthy, and out of mischief. Another favorite part of the holidays is all the delectable food and treats. While we may find them delicious, most holiday foods a big no-no for puppies. Remind your guests not to feed your puppy anything off their plates. Be especially careful to prevent your puppy from consuming any chocolate, sugar-free candy or peanut butter containing Xylitol. Raw bread dough and rich, fatty foods should also be avoided. When you are aware of how to prepare for the holidays with a new puppy in the house, you can all have an enjoyable and safe holiday season. If you are looking for an English bull terrier for sale to gift for the upcoming holiday season, it is still good to know how to prepare to ensure the holidays are enjoyable and relaxing for everyone involved.